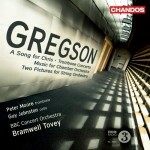 More memorable, though, was composer-in-residence Edward Gregson’s ‘Goddess’, with sonorities and elegiac yearning from the viola soloist Rachel Roberts, sensual lyricism throughout, and a beautifully conceived ending where the music evaporated in shadowy threads of melody, harmonics and tremolo shivers. Yet there was another stand-out moment ….the ecstatic Goddess (2009), by the composer-in-residence Edward Gregson. It was fabulously played by the solo violist Rachel Roberts, the Presteigne Festival Orchestra and George Vass. Also on this varied programme for string orchestra [was] Edward Gregson’s beautifully lyrical Goddess ….